From noted short story writer Nisi Shawl comes a brilliant alternate-history novel set in the Belgian Congo. What if the African natives developed steam power ahead of their colonial oppressors? What might have come of Belgium's disastrous colonization of the Congo if the native populations had learned about steam technology a bit earlier? Fabian Socialists from Great Britain join forces with African-American missionaries to purchase land from the Belgian Congo's "owner," King Leopold II. This land, named Everfair, is set aside as a safe haven, an imaginary Utopia for native populations of the Congo as well as escaped slaves returning from America and other places where African natives were being mistreated. Shawl's speculative masterpiece manages to turn one of the worst human rights disasters on record into a marvelous and exciting exploration of the possibilities inherent in a turn of history. Everfair is told from a multiplicity of voices: Africans, Europeans, East Asians, and African Americans in complex relationships with one another, in a compelling range of voices that have historically been silenced. 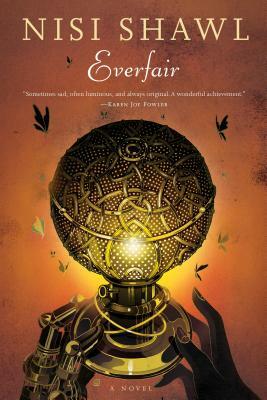 Everfair is not only a beautiful book but an educational and inspiring one that will give the reader new insight into an often ignored period of history. Nisi Shawl is a writer of science fiction and fantasy short stories and a journalist. She is the co-author (with Cynthia Ward) of Writing the Other: Bridging Cultural Differences for Successful Fiction. Her short stories have appeared in Asimov's, Strange Horizons, and numerous other magazines and anthologies.